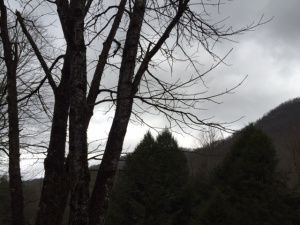 Here in the mountains it’s a gray winter day. We arrived the day after Christmas for our annual holiday visit. We hoped for snow, but the weather’s so mild that the windows are open. Over the roar of the creek, swollen from a solid week of rain, a single crow caws somewhere nearby. Welcome home, she says. Downstairs the grown-ups are finishing a jigsaw puzzle we’ve been working on since summer. The grandchildren are playing a video game. I’m upstairs writing this, tomorrow’s post, my heart warm with the comforts of home, family, and love.